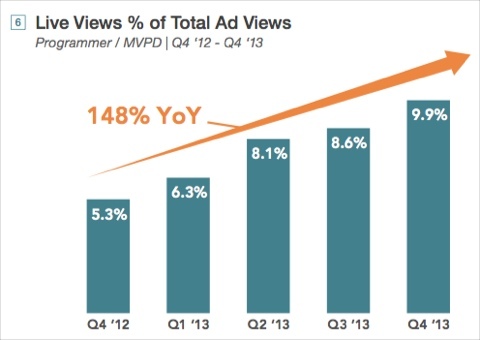 As the chart below shows, in Q4 '13 ad views in live streaming nearly doubled their share vs. the 5.3% in Q4 '12. 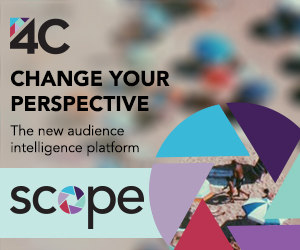 Brian said live streaming is benefiting from a number of successful app launches and, no surprise, is driven mainly by live sports and to a lesser extent by live news. Sports in Q4 included NFL, college football, NBA, golf, etc. Related, ads viewed in long-form authenticated, TV Everywhere content rose 268% vs. Q4 '12. Live content is by far the most important segment of authenticated long-form content, generating 76% of ad views in Q4. 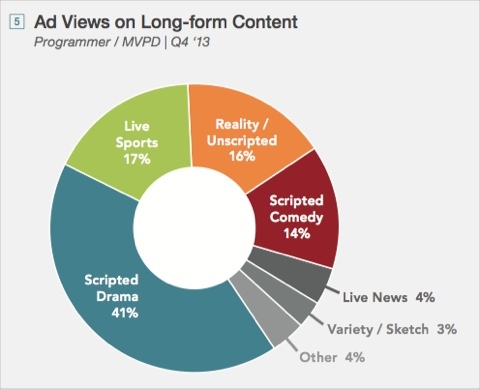 More broadly, as the chart below shows, Scripted Drama is the most important type of long-form content, representing 41% of ad views, followed by Live Sports with 17% and Reality/Unscripted with 16%. Brian noted that this shows how online video mirrors TV, as 8 out of 10 of Nielsen's most time-shifted programs were Scripted Dramas. Meanwhile, video consumption on devices continued to increase, with ad views on mobile phones up 178% vs. Q4 '12 and ad views on tablets up 136%. 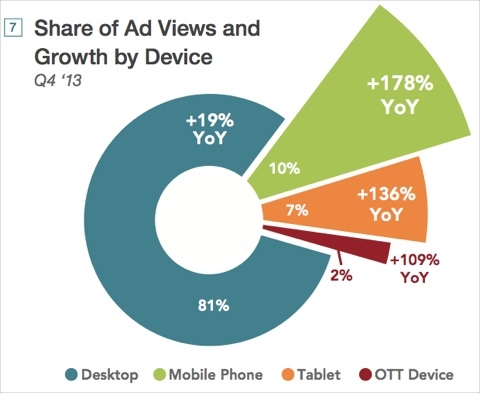 Mobile phones now represent 10% of all ad views and tablets 7%. Desktop is still holding strong for ad views across all videos at 81%, though it drops to 63% for long-form content, where tablets now have a 20% share. Elsewhere in the report, FreeWheel also found that for pay-TV operator and TV network video streams, just 4.8% of ads in Q4 '13 were sold via "resellers," which FreeWheel defines as ad networks and exchanges. These premium publishers still heavily rely on their own direct sales, though the report notes programmatic is playing a bigger role during unexpected traffic spikes of sales shortages (see this post on Weather Company for a good example). Last but not least, ad loads continued to bump up vs. prior quarters, but completion rates remained strong. Rather than reporting the total number of ads in a long-form stream as it has in the past, FreeWheel reported ads per break. In Q4 '13, FreeWheel's clients served 3.2 ads per break, vs. 2.8 in Q4 '12. The share of 30-second spots decreased for short and mid-form content, but for long-form is now up to 68%. Completion rates for long-form stayed roughly steady in the 90%+ range. As always, the FreeWheel report is based on their own clients' data. The report can be downloaded here.